It's also said Christol broke his collar-bone. Attendance: "Parquette was not large, but the gallery was crowded"
Christol is billed as the "Celebrated Champion of the World." There were also a "few preliminaries." McCune was said to be the head of the Des Moines gymnasium. "Whistler spread himself, resting his head nad shoulders on one chair and his feet on the other. In this position, six large men, averaging 175 pounds each, mounted the prostrte body and remained there perhaps a minute." Whistler injured his arm in the second fall and was practically a one-armed man in the final round. Christol gave Whistler $100 of his money back due to the injury. Dr. Carter was in attendance and saw to Whistler. His diagnosis was that Whistler's left arm had suffered a "severe twisting." The injury is said to be nothing serious. This was tendered due to the injuries Whistler suffered against Christol on Saturday. The above listing is from the write-up of the show after it happened. The crowd were intense with excitement. Whistler writes to the New York Times challenging any man in the world to wrestle Graeco-Roman style for $250 - $1,000. The New York Times does not bill it as a for a title, the New York Sun does. Bibby was billed as the English champion. Both men said they had tried and could now throw each other and wil never face each other again. Muldoon weighed 198 pounds, Whistler 172. Quigley was Muldoon's trained, Patrick Kelly his umpire. Whistler's umpire was Samuel Berry (of Philadelphia). John McMahon, Edwin Bibby, Mackeson and Thiebaud Bauer were in attendance. At the end of each hour of wrestling the duo stopped for a 10 minute rub down and rest, with exception of between the fifth and sixth hour where there appears to have been only five minutes. Neither man wanted the bout to end in a draw and neither did the audience. Time was called when the owner of the venue turned the gas lights and the main lights off shortly before four in the morning. People in the audience offered to pay an extra $1 a piece to turn the lights back on to continue with the contest, but the owner would not agree. It was agreed that they would meet at a later date to decide a winner. Show also featured, boxing, fencing, single-stick, and club swinging. Dufur weighs 192 pounds and stands 6 feet 1 inch, Whistler 170 pounds and 5 feet 8.5 inches. Said to have been "No 'hippodroming' about it." Whistler said to be in poor condition with large boils on his forehead and elbow. The boil on Whistler's forehead began bleeding during the first fall. Dufur quit in the fourth round when the referee asked if he wanted to, due to Whistler wrenching on Dufur's arm. Dufur claimed it was broken. It is said he could be heard crying out for Whistler not to break it while it was applied. Dr's advised the arm wasn't broke, but the biceps and shoulder joint were terrible sprained. Duncan C. Ross challenges Whistler and Muldoon to face for either of their respective championships that they claim. 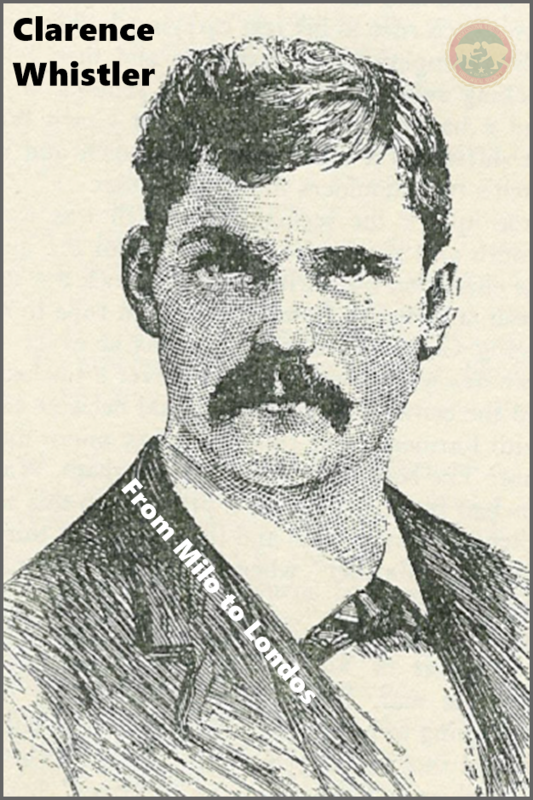 Announced that Whistler was late getting here due to an accident to Muldoon, Whistlers backer, he sends a telegram to explain and says will be there today with money. The first bout was catch-as-catch-can and after a struggle, Ross gave up and gave the fall to Whistler. Whistler decided in turn he would automatically forfeit both Collar & Elbow bouts, Ross protested, but the referee decided it was Whistler's right to. The fourth bout was catch-as-catch-can. The fifth bout was due to be Graeco-Roman. Ross stated that three points would have to touch for a fall, this was disputed as only being two points needed. The referee read the rules as printed in a newspaper and it confirmed two points. Ross then pointed out that the rules had stated the bouts to take place between 8 and 12 and as it was past 12 the match was off. The referee consulted the timekeeper who declared it was 2 minutes to 12 and the match could continue and if Ross refused he would be declared the loser and receive no stakes. Ross put on his coat and walked out. The Daily Globe says the match was a "Miserable fiasco." This is from a British newspaper biography of Cannon in 1895 written by a "Welsh Athlete." Whistler is 28 years old, 5 feet 7 inches tall and 165 pounds. Both men agreed to call it a draw, the crowd wanted the contest to continue. The National Republican states "Spectators left the building disgusted." Shields is the champion of Rich Hill. Whistler is listed as the champion of America. This could be late April 1883. At one point in the match both men rolled off the five foot high stage and continued wrestling on the floor after the drop. Whistler injured his shoulder on a bad landing and it was agreed to call it a draw, although Muldoon claim he should be awarded the fall. The Sacramento Daily Record-Union states Whistler should have won the match on several disallowed falls. Muldoon said he was tired during the third hour and the match was declared a draw as it was not going anywhere. Whistler also gave an exhibition in strength. Also an open challenge to any man who can throw Whistler. Some people failed to appear on the card. Whistler-Dutchy was said to be very lively. Possibly actually the May 31, 1883 match with a favorable view of Cannon's performance. Delmas is said to be the French Champion. Whistler is said to be the American Champion. The Sacramento paper for the September 18, 1884 is not available. Results from the Daily Alta. Whistler asked for a 5 minute rub off at the end of the third fall. Delmas refused, stating it was not allowed to break hold if one party refused. Delmas refused to release his grip and thus the referee disqualified him. "Harry Maynard says the referee was wrong, as they can't rest to rub off if either party objects." Also featured broad-sword cmabat, boxing and dumbbell lifting. This is from an 1895 British biographical account of Cannon written by a "Welsh Athlete." Ross won the coin toss to decide the fifth fall. Whistler accepts a challenge to face Thomas for £100 a side. Will be ready face Dinnie or Miller afterward. Whistler is listed as the American Graeco-Roman and Catch-as-Catch-Can Champion. Miller was the Australian Heavyweight Champion going into the battle.